To manage the ads from your website you can go to the Ads List section on the backend. The ads are displayed in a list with some useful information presented in columns. Multiple sorting and filtering features are found here. An ads manager is implemented, that allows you to filter ads when browsing. You can enter a keyword or a specific username to search for, along with the option to sort by columns. Useful information is displayed per column about each ad like title, author, end date, number of views and more. From here you can also Block/Unblock certain ads. This method of blocking ads is recommended for the ones with bad titles, or if they advertise something inappropriate for your website. If you want to check or edit the content of an ad, click on its title. On the left side of the page you can see the ad itself with all the details and with the option to set it as featured, while on the right side you will find the user details and messages along with a panel, where you can change the status and type of the ad or the availability period. Other applicable filters are for the sender or receiver of the offer. You can search by a certain username using these filters. Various information is available for you to check here, such as the name of the ads, status of the offer, sender rating or time&date of the last update. Clicking on the column headers will sort them accordingly. 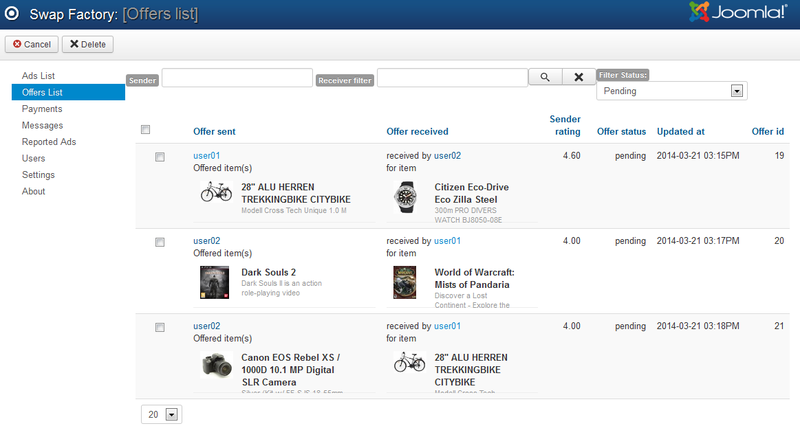 With the Messages page you can view a list of all the messages sent on the frontent within the available ads. Besides the message itself, you can view the date when it was sent, the user who sent it, the receiver and the ad in question. You can manage these messages by deleting or publish/unpublish them. The Reported Ads page allows you to manage the reports made by writing messages to the respective ad owners or to edit their ads. These are ads that users have viewed as inappropriate and have been reported. You can see the date when the report was made, a message which describes the reason for the report, the user who made it and if the reported case is in progress or if it has been already solved. A filtering system is also available. You can search by a specific keyword or select to display only the Solved/Unsolved reports. After you are done with an issue, you can change it's status to Solved.